One of the key benefits of intermittent fasting is the lowered insulin resistance, or increased insulin sensitivity, that can be gained. Over 180 million people across the world use cannabis in some way, many of them doing so chronically.1A concern that chronic cannabis users may be curious about, is whether or not cannabis use affects insulin sensitivity. There is not a large amount of research on this, but some current research suggests that marijuana usage may be associated with lower insulin resistance and potentially lower body mass index. Given some of the potential benefits of cannabis, such as potential improvements in creativity, and changes in mood, it is important to take into account potential undesired effects when considering whether or not to use cannabis. In general, there is a lot of scientific evidence suggesting that intermittent fasting can be beneficial for increasing insulin sensitivity. Studies have shown that in both animals and humans, intermittent fasting could lead to higher activation of insulin-like growth factor activity, which is positively correlated with insulin sensitivity.2,3Further, research has shown that intermittent fasting would significantly increase glucose uptake in the bloodstream.3Read more about the metabolic benefits of intermittent fasting here. The effects of marijuana consumption on insulin sensitivity have not been widely studied, but one recent study on 4657 subjects is of interest. In this study, 579 were current marijuana users, 1975 were past marijuana users, and the rest were controls. The subjects were followed over a time period of 5 years (2005-2010) via self report surveys and glucose and insulin level measurements. It was found that marijuana usage was correlated with 16% lower fasting insulin levels, which is a proxy for insulin resistance (P<0.0001, average of 10.1 mU/mL for people who never used marijuana vs. average of 7.5 mU/mL for current users of marijuana). Furthermore, this study also used the Homeostatic Model Assessment (HOMA) model of Insulin Resistance to assess the groups of patients, and found that by this measure there was a lower amount of insulin resistance / higher insulin sensitivity in the people using marijuana compared to those did not. The HOMA model is a mathematical formula taking into account physiological parameters including production rates of insulin and changes in blood levels of insulin and glucose over time, and has been used in over 500 publications. Thus, it is promising to see this trend with the HOMA model in relation to marijuana use. Marijuana usage has been found to be associated with increased visceral body fat (P<0.05), compared to control subjects, in a study involving 30 marijuana users (using for an average of 9.5 years, and 6 joints per day) and 30 controls.10However, in this study, there was not a significant association of marijuana usage with insulin resistance, BMI, or fasting levels of glucose, insulin, total cholesterol, LDL cholesterol, triglycerides, or free fatty acids (FFA). 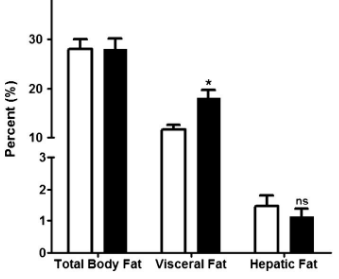 In a study involving 30 marijuana users and 30 controls, it was found that marijuana users had significantly higher amounts of visceral body fat, but similar levels of total body fat and hepatic fat as non-users. All in all, due to some conflicting research papers, as well as relative dearth of large-scale studies on physiological changes with respect to insulin sensitivity and other metabolic correlates, future research should focus on teasing out how all of these factors relate to each other in large populations. Some of the short-term side effects of marijuana include short-term memory disturbances, anxiety, lowered reaction time, problems with coordination and sexual dysfunction.11Longer-term side effects include decline in IQ, increased cortisol levels12,13, disruption of the menstrual cycle14, and decreased prolactin levels13. While there are studies that show that marijuana usage has been correlated with favorable metabolic trends with respect to weight loss and insulin resistance, there are some potential undesired effects with respect to hormonal changes and cognitive changes that are important to be aware of. Usage of marijuana should be assessed on a case by case basis by the potential user. Note that marijuana is only legalized in certain parts of the world. Brandhorst, S., Choi, I. Y., Wei, M., Cheng, C. W., Sedrakyan, S., Navarrete, G., ... & Di Biase, S. (2015). A periodic diet that mimics fasting promotes multi-system regeneration, enhanced cognitive performance, and healthspan. Cell metabolism, 22(1), 86-99. Halberg, N., Henriksen, M., Söderhamn, N., Stallknecht, B., Ploug, T., Schjerling, P., & Dela, F. (2005). Effect of intermittent fasting and refeeding on insulin action in healthy men. Journal of Applied Physiology, 99(6), 2128-2136. Penner, E. A., Buettner, H., & Mittleman, M. A. (2013). The impact of marijuana use on glucose, insulin, and insulin resistance among US adults. The American journal of medicine, 126(7), 583-589. Rodondi, N., Pletcher, M. J., Liu, K., Hulley, S. B., & Sidney, S. (2006). Marijuana use, diet, body mass index, and cardiovascular risk factors (from the CARDIA study). The American journal of cardiology, 98(4), 478-484. Smit, E., & Crespo, C. J. (2001). Dietary intake and nutritional status of US adult marijuana users: results from the Third National Health and Nutrition Examination Survey. Public health nutrition, 4(03), 781-786. Le Strat, Y., & Le Foll, B. (2011). Obesity and cannabis use: results from 2 representative national surveys. American journal of epidemiology, kwr200. Bancks, M. P., Pletcher, M. J., Kertesz, S. G., Sidney, S., Rana, J. S., & Schreiner, P. J. (2015). Marijuana use and risk of prediabetes and diabetes by middle adulthood: the Coronary Artery Risk Development in Young Adults (CARDIA) study. Diabetologia, 58(12), 2736-2744. American Diabetes Association. (2015). 2. Classification and diagnosis of diabetes. Diabetes care, 38(Supplement 1), S8-S16. Muniyappa, R., Sable, S., Ouwerkerk, R., Mari, A., Gharib, A. M., Walter, M., ... & Kunos, G. (2013). Metabolic effects of chronic cannabis smoking. Diabetes Care, 36(8), 2415-2422. Julien, R. M. (2013). A primer of drug action: A concise nontechnical guide to the actions, uses, and side effects of psychoactive drugs, revised and updated. Holt Paperbacks. Kirkham, T. C. (2009). Cannabinoids and appetite: food craving and food pleasure. International Review of Psychiatry, 21(2), 163-171. Klumpers, L. E., Cole, D. M., Khalili-Mahani, N., Soeter, R. P., te Beek, E. T., Rombouts, S. A., & van Gerven, J. M. (2012). Manipulating brain connectivity with δ 9-tetrahydrocannabinol: a pharmacological resting state FMRI study. Neuroimage, 63(3), 1701-1711. National Institute on Drug Abuse, & United States of America. (1995). Marijuana: Facts Parents Need to Know.